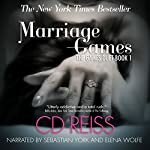 This was one of the best audios I’ve listened to in the romance genre. The two narrators were superb but not only that, this book is mainly made up of dialogue and instead of being POV narration-driven, dialogue was dual narrated. This enhanced everything about this book. Adam started out as the wronged, hurt husband, gaining my sympathy quickly despite knowing his past. Let’s put it this way, I’m not in his fan club right now, but there’s a part of me still rooting for him. I really couldn’t quite get the measure of Diana initially and didn’t understand her decisions. What progresses between these two is like a runaway train, but they’re both convinced they’re in control. I enjoyed this story and the characters hugely. I am an anti-Dom/sub fan, so the fact I loved this so much speaks of the author’s talent. I am waiting with bated breath for next book and conclusion to this compelling story.